I've been humming the tune of the Beatles song, I Want to Hold Your Hand since my radio interview on WLW in Cincinnati today. What did Eddie and Tracy want to talk about? 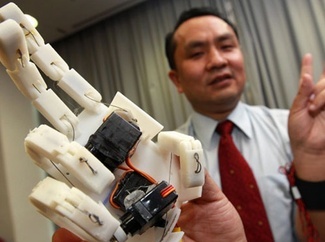 The new device called the cyber hand. Can you imagine this? A robotic hand that will allow you to hold the hand of your online date over the Internet has been just been created and will roll out before the end of the year. According to an article in the The Sun - UK, the cyber hand was designed by Professor Liu Yunhui in Hong Kong. The device plugs into your computer and communicates with an electronic wristband to allow online daters to have the sensation of touch. The new robotic hand is able to give the "V sign" and the sign for "OK."
The device was originally invented to help the elderly keep in contact with their loved ones and family in a more personal way. The Daily Mail -UK reports that Professor Liu believes that although people can show their care through phone calls, physical touch is still a better way to express love. "With the system, elderly people and their children and grandchildren can touch and hold hands via the internet and show affection directly," says Professior Liu. But will it keep you warm at night? The Cyber hand is expected to go on sale in time for Christmas and would make an interesting stocking stuffer for the tech-savvy singles looking for love online or those in a long-distance relationship.